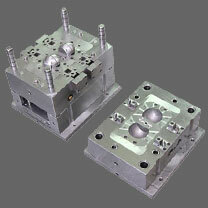 The process of compression molding may be simply described by reference like two-piece mold provides a cavity in the shape of the desired molded article. The mold is heated, and an appropriate amount of molding material is loaded into the lower half of the mold. The two parts of the mold are brought together under pressure. The compound, softened by heat, is thereby welded into a continuous mass having the shape of the cavity. The mass then must be hardened, so that it can be removed without distortion when the mold is opened. If the plastic is a thermosetting one, the hardening is affected by further heating, under pressure, in the mold. If it is a thermoplastic, the hardening is affected by chilling, under pressure, in the mold. Compression molding is used principally for thermosetting plastics, and much less commonly for thermoplastics (for which injection is the preferred method of molding). Extrusion of thermoplastic materials can be accomplished through various means, depending upon the product being manufactured. Typically, extrusion with polymeric materials (plastics) involves a continuous operation as opposed to making a product with an intermittent process as done in injection molding. The various products made by extrusion include pipe, tubing, coating of wire, plastic bottles (blow molding), plastic films and sheets, various plastic bags (blown film), coatings for paper and foil, fibers, filaments, yams, tapes, plastic plates and cups (thermoformed sheet), and a wide array of profiles. Extrusion is accomplished by melting the material and forcing the melt through a forming die. The polymer material is fed to the extruder through a feed opening and can be introduced to the extruder in pellet (or cube) form or alternately as a powder, a granulate, or, in some processes, a melt. Extruders used in rubber extrusion and with some adhesives must accept a strip as the feed form .The extruders that are fed a melt are used for pumping to pressurize and to force the material through the die system or to aid in such parameters as cooling the melt from a melting extruder. The typical extruder is required to take a solid feed material and to melt, homogenize and pump the melt through the die system with acceptable output uniformity. The output consistency is measured by the uniformity of the dimensions of the finished product. The extruded melt is continuously shaped and cooled by downstream equipment placed after the extruder. This sizing/cooling equipment can be comprised of cooling rolls, water tanks, and vacuum sizing fixtures, air cooling tables, pulling devices, cutting equipment, coiling or winding equipment, and so on.